Hop along to Carymoor with your children during the Easter holidays for some eggciting family activities. 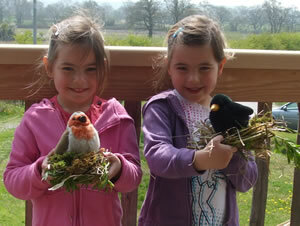 Eggsplore our nature reserve on our Egg Hunt with a difference. How many creatures can you think of that lay eggs? Test your construction skills in our Nest Building Challenge - do you think you could make a bird's nest as well as a blackbird or robin? Get creative with natural materials to make a range of eggcellent Spring Crafts - fun things like teasel Easter bunnies, willow crowns and eggshell mosaics. 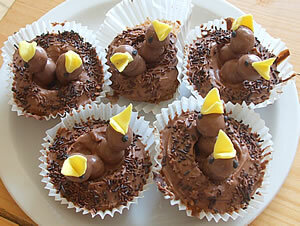 Enjoy some light refreshments, including mini bird's nest cakes for the children, on sale in our education centre. The centre will be open on Thursday 5th and Wednesday 11th April from 10 .00 am - 12.00 noon and 2.00 pm - 4.00 pm. There is a small charge of £7.00 per family (up to 4 people including at least one adult) plus £2.00 for each additional participant, which includes craft materials. Our half-term family event proved to be very popular, so please book well in advance. For more information or to book, email [ or phone 01963 350143. See our website www.carymoor.org.uk to find out about other events at Carymoor.